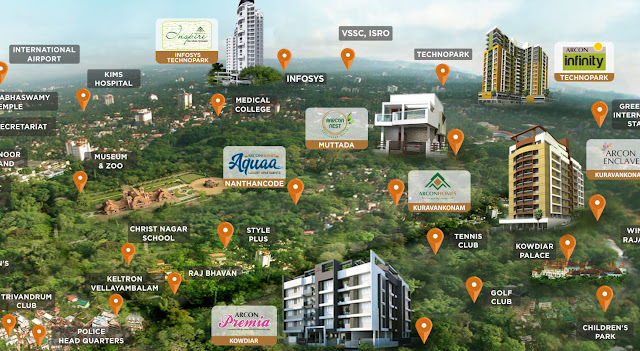 Archon Homes one of the leading builders in the capital city has launched its new project Arcon Inspire near Infosys, Technopark. The Arcon Inspire offers 2 and 3 BHK Premium Luxury apartments. Amenities include Infinity swimming pool with party deck, Designer entrance lobby with visitors lounge, Childrens play area with equipments, Association Hall, Multipurpose Hall, Air conditioned Mini theatre, Fully equipped a/c Unisex gym, Roof top party area, Solar panel for common area lighting, Intercom facility, Security cabin, Biometric access, CCTV, Power backup, Reticulated gas supply, Provision for Wifi internet, Gas leakage detector. Arcon Home Builders Pvt. Ltd.